Daring Bakers Challenge - Opera Cake! I was so excited to hear that this month's challenge would be opera cake that I ran home and made it the day it was announced. No, I'm not joking. For those of you who have read my stories of procrastination in the past, I am sure you are shocked. I had many reasons - I had made a strawberry mousse that was not great on its own and needed something to do with it, and the students in the music department were doing an oratorio the next day. I decided my first cake, rather than being an opera cake, would be an oratorio cake! Before heading home I skimmed through the text of Dona Nobis Pacem by Ralph Vaughan Williams and wrote down some catchy phrases to potentially use in decorating. I went grocery shopping and then raided my cupboards to try to find an interesting flavor combination. I was originally going to do strawberry and cardamom, but then I spied the rosewater that I don't think I had used since making rice pudding almost two years ago. (The thought suddenly occurs to me that maybe it had expired, but I didn't kill anyone). 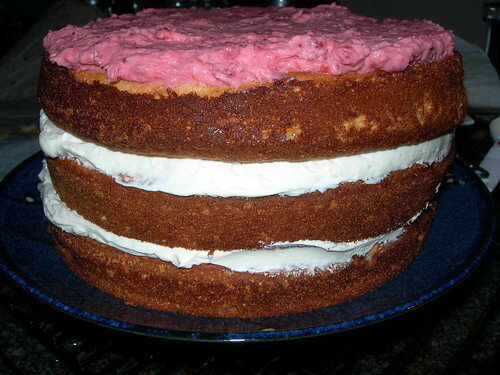 I decided to use strawberry just in the mousse, and rose everywhere else - the cake, the syrup, and the buttercream. I baked the Oratorio Cake in three rounds rather than using the jelly roll pan approach the first time, but even after an extended amount of time they still were not really done. I tried to flip one over too soon, but then saw how undone it was inside. 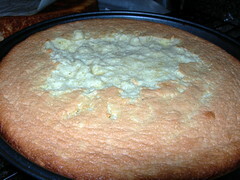 This picture is the aftermath, after properly baking. Phew, disaster averted. I do like these cake layers with very little flour though. It got me thinking about creative things to do instead of almonds - surely other nuts. I wonder if things such as graham cracker crumbs would have worked. Can you substitute those for nuts or flour? I'll have to try sometime (mental note). The buttercream wasn't quite as nice as Dorie's recipe but I still had no problems with it breaking or anything. 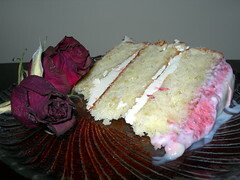 The rose flavor was delicate but nice, and I colored the remainder to decorate the top of the cake. I still had enough left over to make what are now forever known as stress cupcakes. 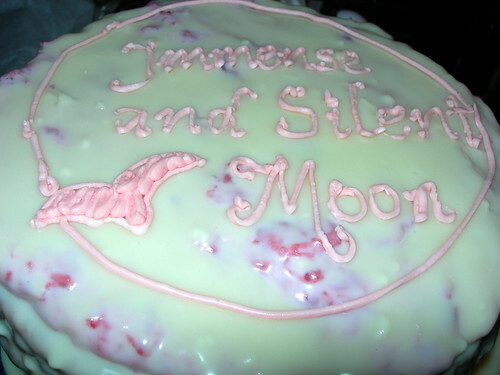 I ended up being very happy that I had picked round cake pans for the Rose Strawberry Oratorio Cake, since the quotation I liked the most was about the moon. I brought it into the music library the next day. The student workers and a bunch of other students devoured it, in fact I had students coming back in unabashedly asking for seconds. For normal things like cookies or brownies, this doesn't surprise me, but I honestly was not convinced that the rose, almond, white chocolate, and strawberry combination would be pleasing to college student palates. Since I live in South Carolina, we get a lot of spring fruits coming in really early. This month was the month for strawberries AND rhubarb, and I had been wanting to try something else with rhubarb. When Tartlette made this rhubarb mousse, I e-mailed her to ask if I could borrow the recipe for my opera cake, not wanting to use it if she was planning to. Her recipes are always superb, but this mousse was light and foamy and delicious. I didn't want to just make a rhubarb opera cake. 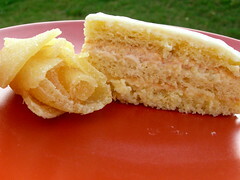 I decided to incorporate ginger in some way, because it seemed that a lot of traditional rhubarb recipes added ginger. I was at Tea Junction in the local mall and they had premade simple syrups - I almost jumped ship and went with lavender instead of ginger, but ultimately decided the white ginger would be nice. This time I added it to the cake as well as the buttercream, and used it as a substitute for the syrup that is brushed onto the cake layers. I went ahead and used the three square layers this time around, and was pleased with the result, even if I skipped the white chocolate layer and didn't really decorate. As you can see above I attempted to make a rose out of rolled out crystallized ginger, in a similar way I have seen flowers made out of gumdrops, but it was unwieldy. The toothpicks are an indication of how I prepared it for transportation since the square cake wouldn't fit in my round cake transporter! I liked the spring flavors in this, but think I would like the chocolate version the most! This month was hosted by Ivonne from Cream Puffs in Venice, Lis from La Mia Cucina, Fran from Apples Peaches Pumpkin Pie, and Shea of Whiskful. The Daring Bakers have grown so huge, we are now hosting challenges with small armies, in order to involve our newer members before the next century. To view all the Daring Bakers posts for this challenge, please view the blogroll. Mousse, which is French for "foam," is usually a light, airy dessert with whipped cream and/or egg whites, often using gelatin to stabilize (see various web definitions). 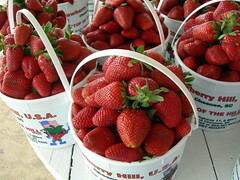 This past month, both strawberries and rhubarb have been available in the sunny state of South Carolina. I was tired of desserts that masked the vivid brightness of these fresh fruits, and thought I would try making mousse to see if that would allow the flavor of the fruit to come through. At the end of April we drove up to Strawberry Hill USA, a local farm growing strawberries and peaches. We bought a bucket of the largest, juiciest, sweetest strawberries I have ever had, and that is including the 20 years I lived right down the mountain from the Oregon strawberry fields that I would pick in for jam every summer with my Mom and sisters. I knew I didn't have long before they started to go bad, so I used the last half for the strawberry mousse. Earlier in April I had gone through a bunch of recipes from The Enchanted Broccoli Forest and remembered a fresh strawberry mousse recipe that I had wanted to try. 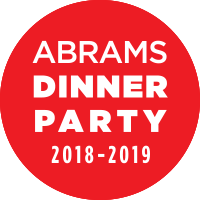 Since the cookbook is vegetarian, it relies on cornstarch as a thickener rather than gelatin. Unfortunately this does cause some issues with texture - instead of the light, foamy, airy feel I was hoping for, it is a bit cloying on the tongue. The heaviness also masks the freshness of the strawberries, and I think a bowl of strawberries may have been preferable to the mousse! 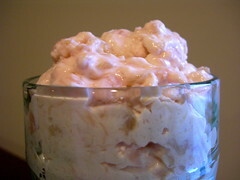 A few weeks later I ran into a recipe for rhubarb mousse on Tartlette's baking blog. 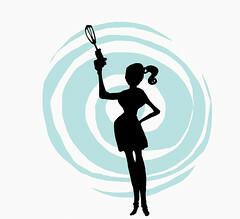 She is one of my favorite bakers and I always marvel at how she brings elements together into one beautiful, perfect dessert. 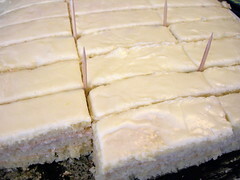 She used a rhubarb mousse in a lemon rhubarb marscapone mousse cake (follow the link for pictures and recipe), and my main goal was to use my second batch of rhubarb before it went bad waiting for me to get inspired. Rhubarb is tricky - a lot of people have not ever tried it, some claim to hate it, and I personally had not tasted it at all until last year. I didn't want it to be just rhubarb, and added some white ginger simple syrup that I found at a tea shop in the mall. I purposely allowed the rhubarb to stay a little chunky for some texture. 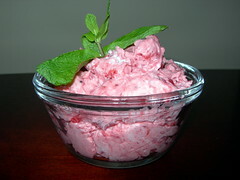 As opposed to the fresh strawberry mousse, this rhubarb ginger mousse was light, airy, foamy, and delicately flavored. The ginger added just a little punch to counteract the tartness of the rhubarb, which of course was also balanced by the light and sweet of the mousse. If I were to make strawberry mousse again, I would start with this basic mousse recipe. We have been house hunting all weekend and might be buying a home this year. I had some rose buttercream (color and flavor) left over and wanted to do something nice for our real estate agent, because she has spent many hours on us in the last week. What is better than making cupcakes? Because of a baking project earlier in the week, I was out of eggs. Looking at homes for four hours is too exhausting, and I was adamant about not going to the store. I did a search for vegan cupcake recipes and adapted a chocolate vegan cupcake recipe into a vanilla one. I would have made almond to go with the rose, but was out of almond extract too. 2. Whisk together the soy milk and vinegar in a large bowl, and set aside for a few minutes to curdle. Add the sugar, oil, vanilla extract, and rose water, to the soy milk mixture and beat until foamy. In a separate bowl, sift together the flour, baking soda, baking powder, and salt. Add in two batches to wet ingredients and beat until no large lumps remain (a few tiny lumps are OK). 3. Pour into liners, filling 3/4 of the way. Bake 18 to 20 minutes, until a toothpick inserted into the center comes out clean. Transfer to a cooling rack and let cool completely. 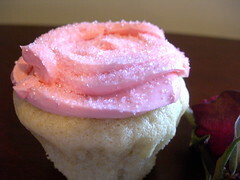 Frost as desired - I should point out that if you use a regular buttercream like I did, the cupcakes are no longer vegan! Simple pink sugar sprinkles make this cupcake look like a respite from mortgage rates and bidding wars and termite inspections. And to me, they tasted delicious - sweet and sugary and the little hint of rose adding a touch of sophistication.